The Consumer Assessment of Healthcare Provider and Systems (CAHPS®) program is a Centers for Medicare and Medicaid Services led initiative that aims to provide more information to consumers to help shape their healthcare decisions. Many CAHPS surveys have become mandatory with the transition to value-based care and new payment models. 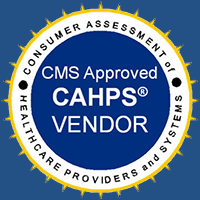 SurveyVitals is a CMS-certified vendor and approved to administer the following CAHPS surveys.